In the last few years, I have been noticing that most people have gone from busy to CRAZY BUSY. We are scheduled tightly from morning to night with an abundance of important activities. The busiest people seem to be parents, especially working moms. When working with families, I find that crazy busy is the new normal….that people are struggling to keep up….which is stressful. It also makes it tough to eat right, exercise and get enough sleep. First – Write it Down on a Calendar! Put the non-negotiables on your calendar and TIME BLOCK! This means mark out the required amount of time on the calendar. Helps us to be realistic about what we really can get done each day. For me this includes the times I want to work since I am self-employed. Next, add in the appointments/commitments for yourself and the family. Some families create a family calendar so everybody knows where the others will be and/or if they are available. This can be done on a big calendar on a wall or on something like Google Calendar on everyone’s phone. I put my exercise on my calendar. To stay healthy or in my case keep working towards feeling better, exercise has become a non-negotiable. I also mark out times for meal prep, meals, quiet time and walking the dog! Second – Prioritize – List what is most urgent each day – read Stephen Covey’s Book on 7 Habits of Highly Effective People. I know I am due a reread!! He has a great system on how to label each task so you know what order they need to be completed. I make myself do the projects that are the most difficult first – otherwise I will procrastinate. Many times I build a reward into getting certain things done I don’t enjoy…or maybe you need to reward yourself when you get to the gym 3 times a week. I reward myself with a No-Chip Manicure every other week – keeps me on track….and I don’t have to fuss with my nails – one less thing for me to do and it makes me happy. The reward has to be something you want in order for it to work! Which brings us to – Third – what can you delegate or get help with? It was hard for my husband to understand that I would rather take another appointment than clean our house. Cleaning the house also exhausted me and generally I was doing it at warp speed before a meeting in our home that I needed to be energized and prepared for. After a few of those meetings where I was fatigued instead of jazzed for my team, I learned that it makes great sense to have help cleaning my home! I also have had help cooking meals, walking the dog, and shopping for about everything we purchase. 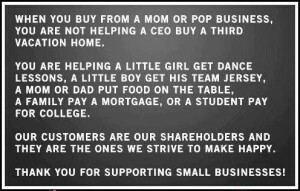 I am a small business owner so I always look for another small business to shop or have services from. 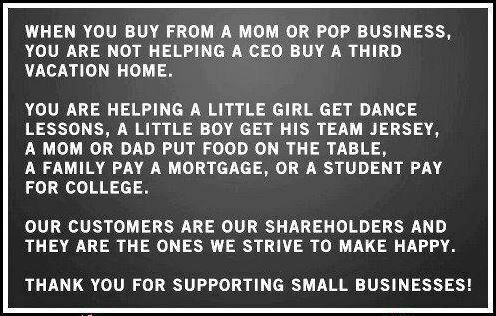 I employ small business people who are affordable and offer awesome customer service. Nothing like having items delivered to your door. Many people think these services will cost more from the local business person than the “Big Box” stores but in most cases, you will save money….and more important to most of us, SAVE TIME! Plus the bonus of supporting people in your network and neighborhood. I found this picture on Facebook and post it whenever I can to help remind everyone to shop with their family member, friend, neighbor before going to the mall. Now one more step before running out to “the store” – CALL ME! I have people that Kris and I Know, Like and TRUST who will serve you! Reliable, personable and affordable professionals who will help you shop, cook amazing meals plus can help/have expertise with dietary concerns, clean your home, do your hair/nails, massage therapists to relieve stress, plan special events, take pictures, help you with scrapbooks, fix your computer, teach you how to use your phone, coach you how to effectively exercise for lasting results, share how to sleep better; it is quite an extensive directory of services and products to help you fight the fact that crazy busy is the new normal. Please leverage our resources to simplify your life! Call Elizabeth & Kris Gronert at (847) 502-8394, email at Elizabeth@yourcomfortforlife.com or message on Facebook. Let us share how to have more Comfort For Life! For immediate help for those who tend to perspire or “flash” while sleeping ( I know many people who are not in menopause but perspire when they sleep who will benefit from these suggestions), let’s look at the bedding first – the layers on your bed DO MAKE A DIFFERENCE! On top of our mattress we have a featherbed – I had always thought that I was allergic to feathers and down….but have learned that today’s products (bought from a reputable resource and paying a reasonable price) are super clean….I had been staying at Westin Hotels – asking for a fiber-filled pillow but sleeping on the rest of the “Heavenly” bed down & feather layers…..with no symptoms. I now sleep on a down pillow and a featherbed….which allows air to circulate underneath me. The down actually “breathes”….it pulls the heat away from my body (and if you are cold, it will warm you up…a featherbed will help two people with different body temperatures sleep together successfully. Sounds hard to believe but now we have helped dozens of couples “enjoy” sleeping together again!) If you truly have a feather allergy, there are many synthetic products being made available today that will circulate air around and under the body. The way down and these other products support and cradle your body is very comforting. It definitely helps me “get to sleep.” Next, invest in high -quality Bamboo Sheets and Pajamas (more Bamboo fabric content than cotton is what you are looking for)…or find one of the many “cool” fabrics available now in bedding and sleeping apparel. (An up and coming fabric is being made from Eucalyptus!) These fabrics were originally developed for people to work out in and then people realized that these fabrics were fabulous for those who perspire while sleeping! You won’t believe how much better you will feel! 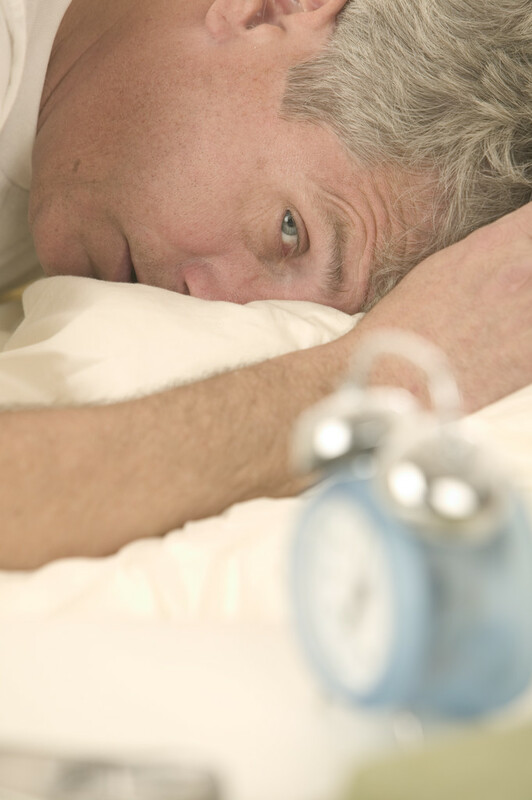 For those going through menopause, the sleep issues may be helped by a visit to your doctor. There are prescriptions and natural supplements that do help! I encourage you to consult with your doctor before adding any supplements into your routine, especially if you are taking other prescriptions, under a doctor’s care or have medical issues. I chose the natural supplement route….and it did take some time to build up and have an effect in my body. I added a menopausal support supplement as recommended (one in the morning, one at dinner)…..as I started the second bottle (month) I wondered if I would feel any benefit. You can tell how patient I am, huh! As usual, patience is a virtue and five weeks after taking this supplement as recommended, I slept 6 hours straight through the night. When I woke up Kris and I looked at each other! He asked me in amazement “is this the first time you have woken up?” Yes it was…..and I have continued to sleep soundly ever since that night. No more flashes. No more tossing and turning. I feel so much better and so lucky to have found this relief……Kris is thrilled too;-) Nothing like a good night’s sleep! This was a good reminder that sometimes it takes more than just a week or two for a supplement, good nutrition and/or essential oils to help! Commitment and consistency is important in all we value!